I must've been really funny that morning! Well, we made it to three months! I know they tell you that time will fly the older you get, but seriously, it's ridiculous when you compare Bimmer today to the Bimmer of 3 months ago! For whatever reason, I was really determined to get her to stay in her 0-3 month sized clothes until she was actually 3 months old. I know it made me feel like we were getting our monies worth and it made Puff feel like we didn't have a fat baby. But this week, I had to give in. She's just too long for some of her sleepers. 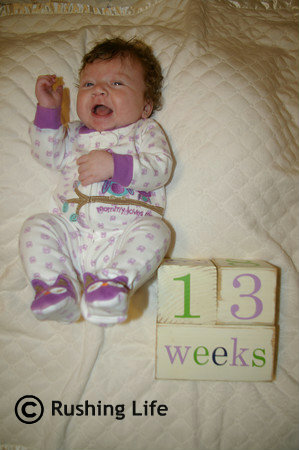 (But she still fits fine in her 3 month onesies!) We had to upgrade to some 3-6 month sleepers. It made me so sad to pack away the little ones she wore the first week she was home with us! We also should probably upgrade to size 2 diapers, since she's been in that size range for awhile now. But I don't like how they fit her. Yes, the size 1 diapers are a smidge too small. But when she poops in the size 2 diapers, it goes all the way up her back, since the diaper goes halfway up her back. So I'm squeezing her tiny hiney into those size 1 dipes as long as I can! Since there is no three month well-baby visit with Doc Hottie, I had to do the ghetto weigh-in of me standing on the scale without holding her and then again holding her. If my math is correct, she weighs in at about 15 pounds. No wonder my arms are getting such a workout these days! Her hair is also really starting to grow in more these days. It's coming in lighter, so her tips are darker than her roots. It's like she has the worst dye job ever. Not to mention it's getting long in the back, so she really has a baby mullet. But it gets pushed up when she lays on her back, so it is just really a mess. But a cute mess. The cutest mess ever. Oh... and I also learned yesterday that I can no longer leave her alone on the bed in her room. Especially when she's angry. I had to take a phone call, so I put her in the middle of the bed, as I have done several times before. I could hear her crying, but didn't think much of it. When I got back into the room, she had managed to move herself about 3 body lengths up the bed and over to the side, so her head was against the wall. Thank God the wall was there to stop her from going any farther! I guess she was just getting so mad that she was digging her heels into the mattress and that was pushing her on her back. She did the same thing later that day in her crib as well. But at least she's confined there! I swear, this girl has got someplace to go! Lastly, an update on her sleeping habits. She did really awesome from week 8 to week 11 with stretches of 6+ hours each night. Then we decided it was time to force her into her crib. She has been gradually moving her bedtime up earlier and earlier, which is fine with me. I'd rather go to bed at 9pm than 10pm myself! And she will typically sleep about 5 hours before needing a bottle and then will sleep another 3 1/2 hours, which puts us around 6am. If it's during the week and I get her in the mornings, I try really really hard to get her to go back to sleep til 8am, which I usually can. It just requires some cuddle time in bed with her on my chest. But I'm totally OK with that. I will take that as long as she will let me.